The form is one of the key tools for the conversion of Internet users in partners, donors and volunteers. With the functionalities offered by the Acore Cadí forms, the entities have many options to manage them very easily, improving communication with the users of the web. We can have fields that will fill the databases in different formats. Some serve to inform the Internet user with Titles, Texts, etc. Others invite you to "enter" data by forcing the format, for example: email, date, texts, etc. And others allow "select" actions, for example from a list of countries or from a drop-down list of options. These fields can be displayed directly on the form tool, or with freedom of design on any page of the web. 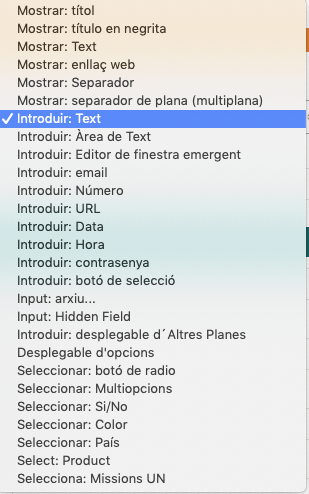 Abcore Cadí shows a custom screen after the user has clicked "send the form." You can also send an automated email. You can also send the data collected to an email address, to an external CRM or to the database of the form itself. The form administrator can follow a customized workflow on the Abcore Cadí platform itself. Within the administrator you can register the different states of each filled form, for example Received-> Answer-> Accepted. Sometimes it is advisable to publish some of the collected data, for example, if we receive support signatures for a campaign. That is why the Data service can display data from the selected fields on the web page, which can be displayed in public, or privately for registered users. If the Internet user visits Google Adwords, the conversion is recorded by linking the published ad with the successful result of the filled form. Trello's desk opens a card with the application data in the entrance column, and puts it at the disposal of the scholarship committee that will complete and move the card by evaluating and selecting it through the counter. On the other hand, Excel exported is used to upload to the massmailing service the list of participants and send with a single click the emails that inform them of the resolution of the committee. In other organizations, for example mariacanals.org, the excel of participants in the piano contest, serves to complete the participant file on a word with the "Match correspondence" function so that the jury has an authentic book of participants with all the data by hand. Simplify the form by eliminating all distractions and links that may distract the user from the completion and sending of the form. Simplify the number of "mandatory" fields. It is better that we ask a donor to have an account number by telephone, rather than giving the donor a donation because he did not have the information at hand when filling out the form and then get distracted in other things. We use the appropriate types of fields (fields of number, date, email, etc.) to obtain robust data validation, and thus prevent the data entered from being erroneous and, if there are errors, they are displayed in the same form clearly identifying the wrong fields providing help to solve the error. We protect the forms under https security certificate. This feature is enabled by default on the entire Abcore Cadí platform. The forms tool is available at Abcore Cadí for all projects, without interrupting the service and at no additional cost. From iWith.org, we invite the organizations to contact the support service if they wish to improve the visual appearance or functionality of their forms. 20/12/2018 - How Abcore Cadí synchronizes photos with Flickr and news of 2019 for free accounts!